Well, we were “unplugged,” but we managed to smuggle videos out anyway for your pleasure… Watch ’em, like ’em, comment to the speakers that you appreciate them giving to the global tech community! Especially since this year they weren’t pre-selected, voting on talks was done at the event, so these folks prepared a talk but weren’t for sure to give it, which takes guts! Hey all! We’re starting work on next year’s DevOpsDays Austin – our seventh here in the ATX. Many of you have come out to the event (or another of the great DevOpsDays around the world). Well, we have some changes in store this year! Last year’s DevOpsDays Austin, “Monsters of DevOps” was bigger than ever and had a stadium rock theme – we had a huge venue, all the DevOps VIPs we could pull down (including the first time all 4 authors of the DevOps Handbook managed to get together at an event), multiple content tracks, killer swag, great food, a hackathon, the best Happy Hour I’ve attended at a conference, we invited in and comped local user groups to give talks… Part of our continuing trajectory to make DoDA more all encompassing and awesome. But – every year we sit down and discuss vision before we launch into the conference. What do we want to accomplish and why? Who are we serving and why? Why are we, personally, putting in huge amounts of unpaid work to serve the community? “Because it’s there and we did it last year” isn’t a good answer, so we like to really put some thought into it. This time when we talked about it, first in our core group and then with the rest of the 2017 organizers, we realized that we’ve been concentrating on “bigger” but we’ve been putting more and more money and effort into the parts of the event that aren’t really of high DevOps value. Here in Texas, it’s easy to conflate bigger with better, since we’re both the biggest and the best! But we’re not sure that’s right. Many of the more expert people we know here in Austin don’t really come out to the event any more, unless they are giving a talk or recruiting for their current gig. Talks and openspaces have kept focused on introducing new people to DevOps, enterprise folks, “horses and donkeys,” and so on. And as we talked, we said “Well – what do we personally get out of the conference nowadays as attendees?” The answer was “not much.” Openspaces are huge and end up being a couple people talking. Talks are either pretty familiar from the conference circuit or also designed for new folks. We have more content but it’s more passive content, sit and watch. It’s good for the newbies but not as much for the experienced folks. We contrasted this to the first couple DevOpsDays we went to in Silicon Valley. The first couple were just in a big auditorium at LinkedIn. There weren’t any sponsor booths. More of the event was focused on the openspaces and interaction between the highly driven participants. We ate box lunches wherever we could perch in the parking lot outside – and swag was just a t-shirt. Heck, the third one was in a weird abandoned building Dave Nielsen had access to, we had to carry our own chairs around to talks and the food and stuff was in a concrete-and-cage loading dock. But it’s those events we got the most out of. Therefore, this year DevOpsDays Austin is going to go to what we call a “Summit” format. We’re reducing the size of the event, and focusing more on local, motivated practitioners. What does this mean? No sponsor tables. We’d love sponsors to participate, but in recent years we’ve gotten more folks who have either just sent aggressive marketers, or sent people we enjoy and then locked then down behind tables. So we’ve come up with a sponsorship package that gets them exposure and value but lets them actually participate in the event. Folks that just want to churn leads will self-select out. The sponsorships are less expensive, and we’ll just have venue food etc. instead of premium. No preselected talks. Well, OK, maybe we’ll have one keynote a day. 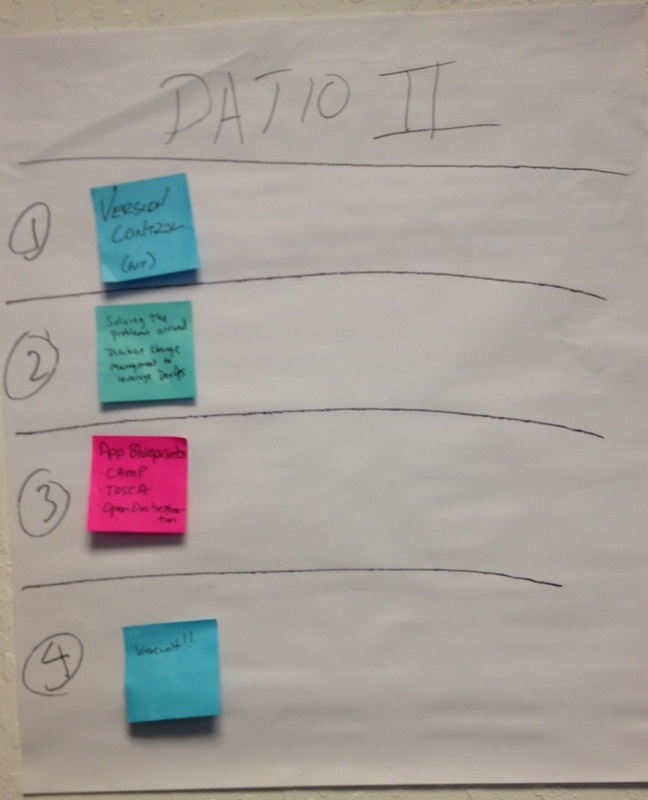 But I went to a ProductCamp here in Austin and they did something brilliant – they had a RFC but don’t do a final selection – finalists show up and the audience votes on what talks they want to hear (kinda like openspaces but more prepared). This means people who say ‘well… I’ll come to your event if I can talk (or sponsor if I can talk, or…)’ will self-select out. You come because you want to be here, and you can give a talk! Smaller headcount. We’re lowering the cap (including sponsors and organizers and volunteers) to 400. We’re going to get openspaces to be the kind of highly engaged discussions that make the so valuable. We’re going to be up front with people that attendees are expected to engage. DoD used to be the only thing around to learn from. But now, if you’re an enterprise person that wants to have some DevOps talked at them – you have variety of options now, like you can go to DevOps Enterprise Summit (also a great event), or to another DevOpsDays like the one in Dallas using the conference format, or one of a dozen events either completely DevOps or DevOps-tracked. But for here in Austin this year, we need something where the unicorns can also have an event meaningful to them, so they can gather and refresh on what’s going on. Not to say only “unicorns” are welcome, but frankly we’d prefer people only come out if they intend to discuss, share, and engage; this will not be a passive-learning friendly event. No streaming. Every year we put a lot of work and money into live-streaming and/or recording the event. But it’s often problematic, and doesn’t get viewed a lot – there’s so much content out there now. But even worse, we end up having to degrade the experience of real attendees around the requirements of broadcast – space, money, schedule, the presenter has to stay in a little box… So we’re not going to do it. You want to participate – come out and participate. But How Can This Work??? That was everyone’s initial reaction to this plan. But that’s silly – it has worked. We’re just doing things that DevOpsDays has already done, that ProductCamp has already done, and so on. It’s just not what’s become customary. After the organizers had a little time for it to sink in, they all rallied behind it with a vengeance. We’ve run the numbers and just the basic $200/head attendee fees can pay for the venue, basic food, and a shirt, even if we get zero sponsors. (We won’t have zero sponsors, we just put our sponsor page up and someone bought in the first hour it was live.) As we get more funding we’ll pump up the event, but deliberately focus on the core experience of highly skilled techies learning from each other, instead of adding distractions. How Dare You Dis My Format??? We’d love to see everyone out at DevOpsDays Austin 2018! Come ready to interact and share. Come ready to give a talk, with the risk it won’t make. Come sponsor your company, just you won’t have a table to lounge at. This change has gotten us excited about running our seventh DevOpsDays, and we bet you’ll love it! We’re entering cool event season… I thought I’d mention a bunch of the upcoming major events you may want to know about! Container Days Austin, Friday evening March 27 and Saturday March 28 ($60), for docker, CoreOS, and containerization fanatics. DevOpsDays Austin 2015, Monday May 4-Tuesday May 5 ($120), for lovers of DevOps. Sponsorships and call for presenters are also open. Keep Austin Agile 2015 – Friday May 8 ($285), for Agilists of all stripes. CloudAustin – Evening meeting every 3rd Tuesday at Rackspace for cloud and related stuff aficionados! Large group, usually presentations with some discussion. 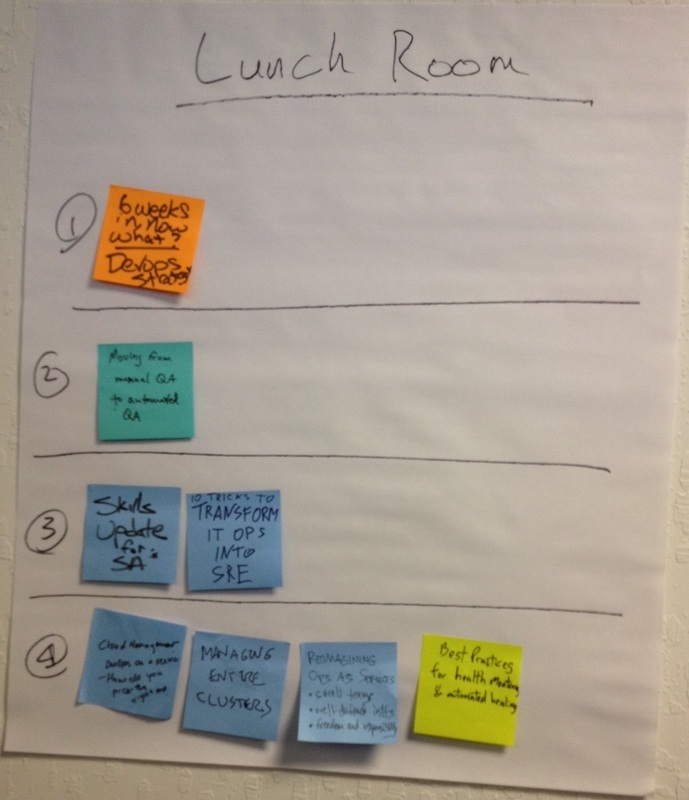 Agile Austin DevOps SIG – Lunchtime discussion, Lean Coffee style, at BancVue about DevOps. Sometimes fourth Wednesdays, sometimes not. There are a lot of other Agile Austin SIGs and meetings as well. Austin DevOps – Evening meetup all about DevOps. Day and location vary. 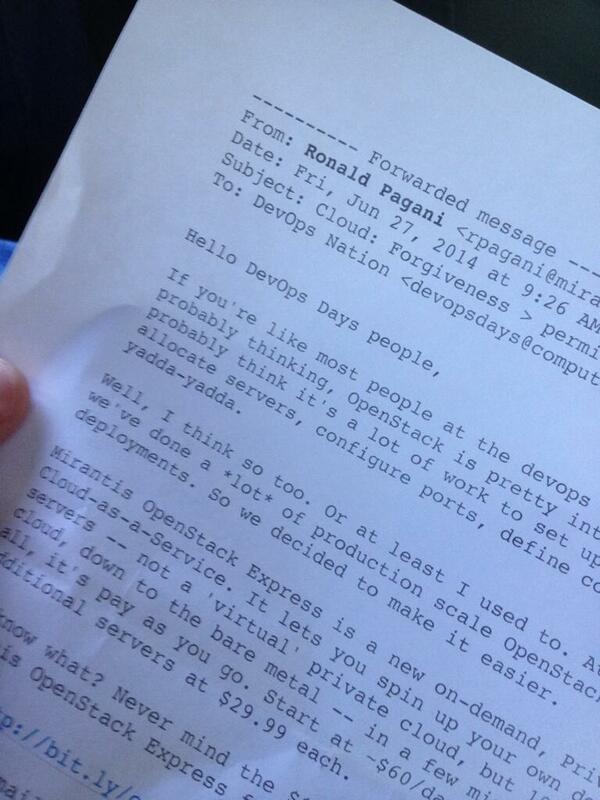 Docker Austin – First Thursday evenings at Rackspace, all about docker. Product Austin – Usually early in the month at Capital Factory. Product management! I have more notes from Velocity, but thought I’d do DevOpsDays first while it’s freshest in my brain. This isn’t a complete report, it’s just my thoughts on the parts I felt moved to actually write down or gave me a notable thought. More notes when I was learning, less when I wasn’t (not a reflection on the quality of the talk, just some things I already knew a bit about). DevOpsDays Silicon Valley 2014 was June 27-28 at the San Jose Computer Museum. 500 people registered; not sure how many showed but I’d guess definitely in excess of 400. First we had John Willis (@botchagalupe) giving the DevOps State of the Union. Here’s the slides (I know it says Amsterdam, he gave it there too.) This consisted of two parts – the first was a review of Gene Kim et al’s 2014 State of DevOps Report – go download it if you haven’t read it, it’s great stuff. Next, our favorite Kanban expert Dominica DeGrandis (@dominicad) spoke on “Why Don’t We Just Say No?” Here’s the slides. As a new product manager, and as a former engineering manager who had engineers that would just take on work till they burst even with me standing there yelling “No! Don’t do it!”, it’s an interesting topic. She goes through a great case study of changing over a big ops shop to a more modern “SRE” model and handle both interrupt and project work by getting metrics, having a lower WIP limit, closing out >90 day old tickets, and saying no to non-emergency last minute requests. In fact, the latter is why I prefer scrum over kanban for operations so far – she contended that devs have an easier time saying no to interrupt work because of the sprint cadence. OK, so adopt a sprint cadence! Anyway, by having some clear definitions of done for workflow stages they managed to improve the state of things considerably. Use kaizen. The book about the Pixar story, Creativity Inc., talks about how the Pixar folks were running themselves ragged to try to finish Toy Story, till someone left their baby in a car because they were too frazzled. “Asking this much of people, even when they wanted to give it, was not acceptable.” What should your WIP level be? The level of “personal safety” would be a great start! It’s interesting – I did some of these things at Bazaarvoice and tried to do some other ones too. But often times the resistance would be from the engineers that the current process was working to death. “We can’t close those old tickets! They have valuable info and analysis and it’s something that needs to happen!” “Yes, but our rate of work done and rate of work intake proves mathematically that they’ll never get done. Keeping them open is therefore us making a false promise to whoever logged those tickets.” Not everyone is able to ruthlessly apply logic to problems – you’d think that would be an engineer attribute but in my experience, not really any more than the general population. But given that “not acceptable” quote above, I really struggled with how to get engineers who were burning themselves out to quit it. It’s harder than you’d think. Next was a fascinating case study from Capital One’s transformation to an agile, BDD, devops-driven environment given by Adam Auerbach (@bugman31). The slides are available on Slideshare. They used the Scaled Agile Framework (SAFe) and BDD/acceptance test driven development with cucumber as well as continuous integration. In a later openspace there were people from Amex, city/state/federal governments, etc. trying to do the same thing – Agile and DevOps aren’t just for the little startups any more! He reported that it really improved their quality. Hmm, from the Googles it looks like the consulting firm LitheSpeed was involved, I met one of their principals at Agile Austin and he really impressed me. Sarah Goff-DuPont (@devtoolsuperfan) spoke about having sales and marketing join the agile teams as well. Some tips included cross-pollinating metrics and joining forces on customer outreach. Just some quick thoughts from the day one Ignites. @seemaj from Enstratius on classic to continuous delivery – slides. Pretty meaty with lots of tool shout-outs – grunt, bowler, angular, yo, bootstrap, grails, chef, rundeck, hubot, etc. I don’t mind a good laundry list of things to go find out more about! Matt Ho on Docker+serf – with Docker there is a service lookup challenge. AWS tagging is a nice solution to that. Serf does that with docker like a peer-to-peer zookeeper. Then he used moustache to generate configs. This is worth looking at – I am a big fan of this approach (we did it ourselves at National Instruments years ago) and I frankly think it’s a crime that the rest of the industry hasn’t woken up to it yet. I went to two. 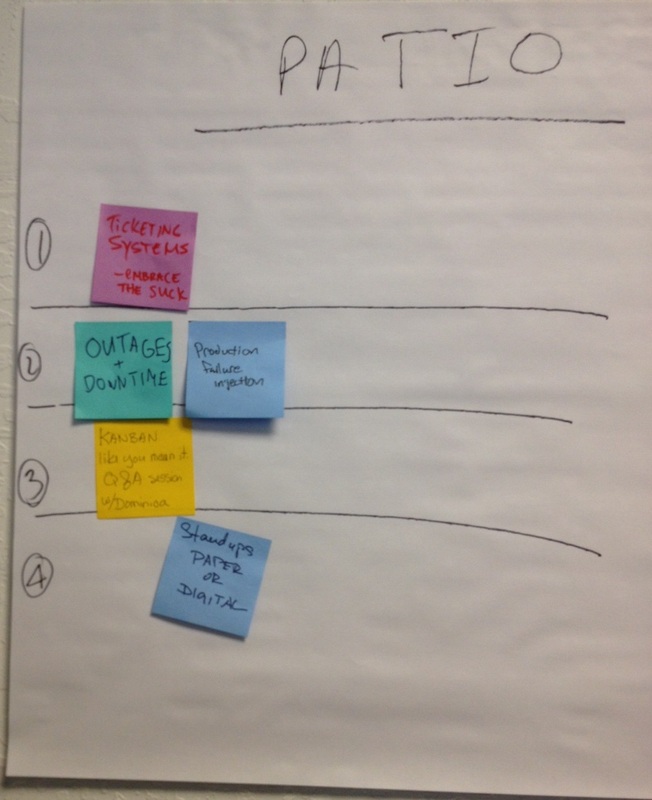 The first was a combination of two openspace pitches, “Enterprise DevOps” and “ITIL, what should it be?” This was unfortunately a bad combination. Most folks wanted to talk about the former, and the Capital One guy was there and people from Amex etc. were starting to share with the group. But the ITIL question was mostly driven by a guy from the company that “bought ITIL” from the UK government and he had a bit of a vendory agenda to push. So most of the good discussion there happened between smaller groups after it broke up. 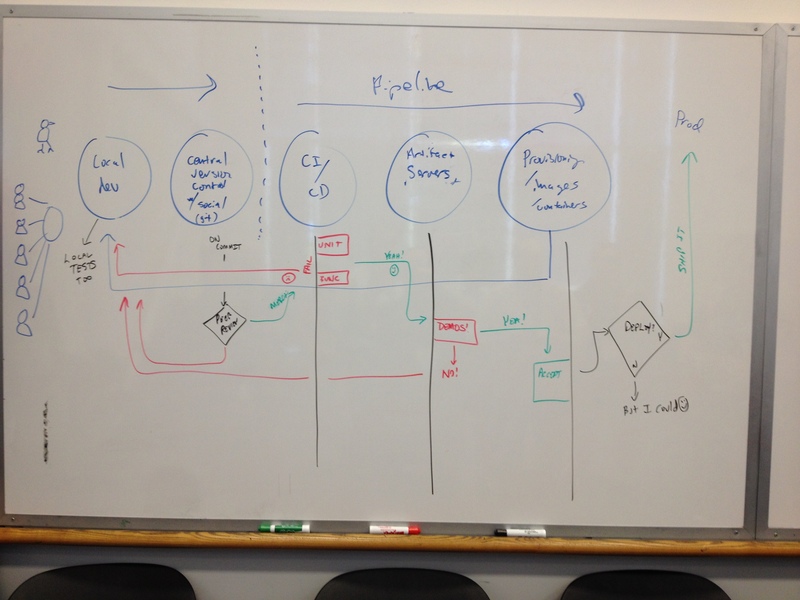 The second was a CI/CD pipeline one, and I got this great pic of what people consider to be “the new standard” pipeline. Next, Day 2 and wrap-up! Meet The Agile Admins At Velocity/DevOpsDays Silicon Valley! Three of the four agile admins (James, Karthik, and myself) will be out at Velocity and DevOpsDays this week. Say hi if you see us!